Gravity, in the context of fermenting alcoholic beverages, refers to the specific gravity, or relative density compared to water, of the wort or must at various stages in the fermentation. The concept is used in brewing and wine making industry. Specific gravity is measured by a hydrometer, refractometer, pycnometer or oscillating U-tube electronic meter. 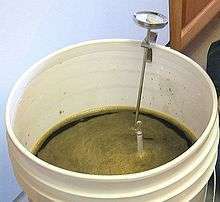 The density of a wort is largely dependent on the sugar content of the wort. During alcohol fermentation, yeast converts sugars into carbon dioxide and alcohol. The decline in the sugar content and the presence of ethanol (which is appreciably less dense than water) drop the density of the wort. The percentage of alcohol can be calculated from the difference between the original gravity (abbreviated OG) of the wort and the current specific gravity (abbreviated SG) of wort. By monitoring the decline in SG over time the brewer obtains information about the health and progress of the fermentation and determines that it is complete when gravity stops declining. If the fermentation is finished, the specific gravity is called the final gravity (abbreviated FG). For example, for a typical strength beer, OG could be 1.050 and FG could be 1.010. Several different scales have been used for measuring the original gravity. For historical reasons, the brewing industry largely uses the Plato scale (°P), which is essentially the same as the Brix scale used by the wine industry. For example, OG 1.050 is roughly equivalent to 12°P. By considering the original gravity, the brewer or vintner obtains an indication as to the probable ultimate alcoholic content of their product. The OE (Original Extract) is often referred to as the "size" of the beer and is, in Europe, often printed on the label as Stammwürze or sometimes just as a percent. In the Czech Republic, for example, they speak of "10 degree beers", "12 degree beers" which refers to the gravity in Plato of the wort before the fermentation. The difference between the original gravity of the wort and the final gravity of the beer is an indication of how much sugar has been turned into alcohol. The bigger the difference, the greater the amount of alcohol present and hence the stronger the beer. This is why strong beers are sometimes referred to as high gravity beers, and "session" or "small" beers are called low gravity beers, even though in theory the final gravity of a strong beer might be lower than that of a session beer because of the greater amount of alcohol present. However, the ASBC table uses apparent specific gravities, so many electronic density meters will produce the correct °P numbers automatically. The Original Gravity is the specific gravity measured before fermentation. From it the analyst can compute the Original Extract which is the mass (grams) of sugar in 100 grams of wort (°P) by use of the Plato scale. The symbol will denote OE in the formulas which follow. The Final Gravity is the specific gravity measured at the completion of fermentation. The Apparent Extract, denoted , is the °P obtained by inserting the FG into the formulas or tables in the Plato article. The use of "apparent" here is not to be confused with the use of that term to describe specific gravity readings which have not been corrected for the effects of air. See the Plato article for details. TE is denoted by the symbol . This is the number of grams of extract remaining in 100 grams of beer at the completion of fermentation. De Clerk also tabulates values for . This is the number of cc of ethanol in 100 cc of beer. With typical values of 1.050 and 1.010 for, respectively, OG and FG this simplified formula gives an ABV of 5.31% as opposed to 5.23% for the more accurate formula. Formulas for alcohol similar to this last simple one abound in the brewing literature and are very popular among home brewers. Formulas such as this one make it possible to mark hydrometers with "potential alcohol" scales based on the assumption that the FG will be close to 1 which is more likely to be the case in wine making than in brewing and it is to vintners that these are usually sold. Because of the near linear relationship between (SG-1) and °P specific gravities can be used in the ADF formula as shown. As an example, a wort of SG 1.050 would be said to have 1000(1.050-1)=50 points, and have Plato degree of approximately 50/4=12.5 °P. Points can be used in the ADF and RDF formulas. Thus a beer with OG 1.050 which fermented to 1.010 would be said to have attenuated 100*(50 - 10)/50 = 80%. Points can also be used in the SG versions of the alcohol formulas. It is simply necessary to multiply by 1000 as points are 1000 times (SG-1). Software tools are available to brewers to convert between the various units of measurement and to adjust mash ingredients and schedules to meet target values. The resulting data can be exchanged via BeerXML to other brewers to facilitate accurate replication.